Drafting a will is essential in order to ensure that your estate and assets are distributed in line with your wishes. A properly drafted will also helps ensure that court proceedings are concluded in a timely manner, and that disputes of your assets and estate are avoided. It is never too early to begin drafting your will; in fact, the earlier you draft your will the easier it is to keep it updated and fair. These 30 blogs will provide you with all the information you need to draft and keep your will up to date. Everyone’s reasons for creating a will are different. Simply put, a will protects both your material assets and your loved ones after you pass away. Although a court can distribute your assets if no will exists, they will not necessarily do so in the way you would have wished. Additionally, a will significantly reduces the legal costs and fees associated with distributing your estate and assets. 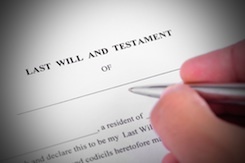 A will is a legal document, so there are rules that dictate what you can and cannot include. It is also important to consider creating a living will, which is a will that details your wishes should you suffer from sudden, serious injury or illness. Both types of wills should contain specific instructions, which leave no room for misinterpretation. Disputes usually arise when your executor is not given enough information to deal with your estate and assets. This can include vague or ambiguous language or the existence of other documents that contradict the wishes expressed in your will. These five blogs will help you avoid disputes and ensure that your assets are distributed in exact accordance with your wishes. The person you choose as executor of your will plays a very important role in ensuring your last wishes are met. Not everyone is cut out for the role of executor, however, so it is vital that you discuss your wishes with your chosen executor and allow them to decide if they wish to take on the role. These five blogs go through the duties of an executor, and who is best suited for the task. You can change your will at any time throughout your life. However, making changes can be difficult if your will is not planned and created effectively. Allowing for the possibility of changes when drafting your first will ensures that you avoid unnecessary issues in the future. There are also legal requirements that you must adhere to when making changes to your will. In these five blogs you will find all the information you need on how to keep your will up to date. Once you have drafted your will, you are going to need to keep it safe. First and foremost, your executor must have access to your will. It is a good idea to create copies, too, in case the original gets lost, stolen or destroyed. These five blogs detail the correct ways to keep your will safe.